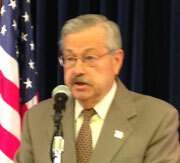 Governor Terry Branstad is asking President Barack Obama to declare 19 Iowa counties federal disaster areas. The governor is making the request based on damage from heavy winds, tornadoes, heavy rains, hail and thunderstorms from June 20th through the 25th. The counties are spread from central Iowa through northeast Iowa and suffered an estimated $5.1 million in damage. They are: Allamakee, Appanoose, Butler, Clayton, Dallas, Davis, Des Moines, Guthrie, Howard, Jefferson, Lee, Lucas, Marion, Mitchell, Monroe, Warren, Wayne, Winneshiek and Wright. The federal designation — if granted — would provide help in rebuilding damaged infrastructure such as roads, bridges, culverts and other public facilities. It would also help to pay for the cost of emergency work and debris removal.